"The whole place was very clean the room was neutral and spot..."
Have a question for B Place Guesthouse? "The best point was the location." "Very basic room, was moderately clean." "Was good value compared to other hotels on the island." "The staff was very nice." Conveniently located in Koh Phi Phi, B Place Guesthouse is a great base from which to explore this vibrant city. Only 0.1 km from the city center, the hotel's strategic location ensures that guests can quickly and easily reach many local points of interest. With its convenient location, the hotel offers easy access to the city's must-see destinations. B Place Guesthouse also offers many facilities to enrich your stay in Koh Phi Phi. Guests of the hotel can enjoy on-site features like free Wi-Fi in all rooms, daily housekeeping, ticket service, luggage storage, Wi-Fi in public areas. The ambiance of B Place Guesthouse is reflected in every guestroom. additional bathroom, clothes rack, linens, locker, mirror are just some of the facilities that can be found throughout the property. Besides, the hotel's host of recreational offerings ensures you have plenty to do during your stay. Superb facilities and an excellent location make the B Place Guesthouse the perfect base from which to enjoy your stay in Koh Phi Phi. The recepetionist is so nice to us. Staff was kind, place was cheap and clean but the bed felt like springs with a layer of cardboard on top. Didn’t sleep at all. Small room, terrible smell of naphthaline (who is still using it nowadays?! 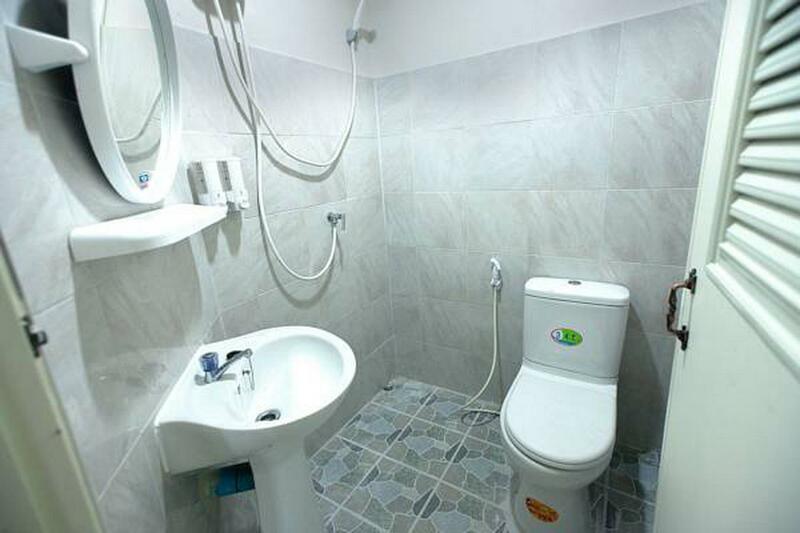 ), small toilet and even the water had a smell of rotten egg (disgusting). Old furnitures, sheets seemed to be clean but there were some stains on them. But the worst is the naphtaline - all our things have the smell of this now :/ I don’t recommend this place. Room had this grimy mould stench throughout and sheets were supplied dirty. Location was great though. Not too far from parties, but also not too close where noise and music was an issue. The place was dirty like all the island, the beach bar next to the hotel play Lound music till 2 o'clock at the night. The air-conditioned smell as well and you can't live it on. I think was the more terrible place I stay ever. Clean, confortable, only the window wasn’t closing well and we were attacked by a whole family of mosquitoes. Although we had a good stay I would like to say that I didn’t like the fact that it seems it’s allowed to party at the guesthouse till late in the night and keep on going with the party early in the morning. There were no people of the staff controlling the reception area so, many young guys drank, shouted and played loud music till 1 am and keep on going with the party at 6 am in the morning. Also, the air conditioner didn’t work the second night. The room was hot and with bad smell due to humidity. Great little guest house, not far from the party beach but far enough away that you can sleep if you head back early... although you can still hear the party in the distance! It’s a bit of a walk with backpacks when you first arrive, we hadn’t pinned the location so struggled without WiFi and walked around in circles for a bit! It’s a lower to mid range place to stay but on PhiPhi everything is a lot more expensive than the rest of Thailand so be prepared to pay more for less on this island if you are travelling around Thailand. The whole place was very clean the room was neutral and spotless and the staff were all very friendly and helpful, we would definitely stay again! My partner and I stayed here for 2 nights and found it to be a great deal for the price. The rooms are simple and the beds are moderately comfortable, but that was really all we needed for the short stay on the island. It's far enough away from the beach bars that you can get a good sleep without hearing music throughout the night. Everything was nice... the staff was very nice... thanks for always put smile on your face..
We stayed here for 5 nights and it was a pleasant stay. We had a clean room, the staff were nice. Easy to get to restaurants and bars etc... honestly had a really good time and would come back. Only issue was there seemed to be times when we had no water, unsure if it was due to peak times or what but wasn’t a major issue. Very basic room, was moderately clean. AC Was good. Location was very good right next to the beach however meant it was noisy. Was good value compared to other hotels on the island. The room was really clean, the A/C was working well and we could adjust the temperature as we needed. There was 24/7 security, so we felt safe. The staff was very nice. The best point was the location. It is a 1 minute walk from the beach and the best parties, but when you're in the room, you don't hear the music. You can also go back easily to go to the bathroom, otherwise you have to pay in restaurants or bar. IT WAS PERFECT, we really like our stay there (6 nights). In the room is a bed, a shower and AC which is all you need for a low budget and only for sleep stay. This was a decent budget place (I had a private room). They allowed me to check in 3 hours early which was nice. However the bed was saggy and the bathroom has a faint sewage smell. The rest of the room was fine though. They have you leave your shoes outside, but they're not protected from rain, which was a big mistake! My shoes got soaking wet and smelled for days. Good location, Not worth the money. Staff was friendly but very loud Walls paper thin We were on the first floor right beside the staff washroom and we could hear everything from that room and everything from the lobby including the staff listening to shows and music extremely loud through out the night. Not worth the money even in low season. Stayed here for a night on New Year's eve. Pretty basic room with air-conditioning and hot shower. Comfortable beds. Very close to the beach but can be pretty tricky to locate as this place is new and the map shown in some website is not accurate. Had an awesome time as the beach clubs is merrily a 5 minutes walk away from this guesthouse. So u can easily walk back after an intense round of Chang beers and cocktails. The staffs are friendly.